Hot Springs, NC is a small mountain town in Madison County. It is best known for the natural hot mineral springs that give the town its name. Hot Springs is a widely popular outdoor recreation spot, whether it be hiking, whitewater rafting, kayaking, mountain biking, horseback riding, or fishing. The French Broad River and the Appalachian Trail both run through the town, which makes Hot Springs an outdoor enthusiast’s dream. Hot Springs Elementary School has won several awards in the recent years, including School of Excellence, School of Distinction, and Top 25 ranking in the State of North Carolina. With an enrollment of around 120 students, each child is sure to get the one-on-one attention they need to succeed in class. The hot springs themselves are one of the main draws for the town. There are 6 separate springs that vary in temperature from 97 to 101 degrees. Aside from the relaxation that comes from sitting in an all natural hot mineral bath, many people use the springs for relief from arthritis and other injuries. One of the springs is reserved for drinking. The water is crystal clear and full of natural minerals. 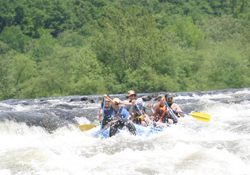 Each year in May, thousands enjoy the French Broad River Festival, 3 days of music, food, mountain bike races, raft races, games, and more. Proceeds from the festival benefit American Whitewater, and it is always a blast! The Bluff Mountain Festival is normally in June and features the area’s best traditional bluegrass music. This festival is free, however there is a day-long raffle for fantastic items donated by local businesses to raise money for the Madison County Arts Council.